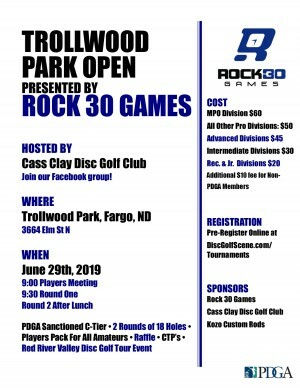 Trollwood Park Open is a PDGA sanctioned C-Tier Event. All amateurs will receive a players pack, which includes a tournament stamped disc. 2 rounds of 18 holes on a modified layout. Players can register online via DiscGolfScene or cash in person. Payouts will be provided using the standard PDGA payout tables. Cass Clay Disc Golf is responsible for refunds, which will be handled in accordance with PDGA standards. This event is part of the Red River Valley Disc Golf Tour. Join the Facebook group for more information. For any questions/concerns, please contact Kalen Hogan or Dylan Schmidt. Cass Clay Disc Golf League is responsible for all refunds/cancelations.